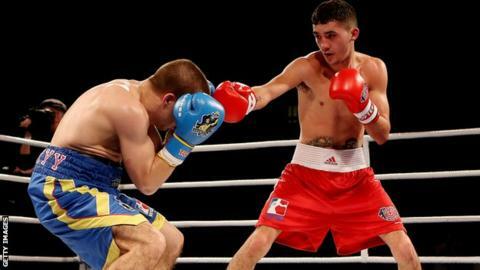 Great Britain will aim to maximise participants at the Rio 2016 Olympics by re-entering a British Lionhearts team into the World Series of Boxing. The Lionhearts debuted in the format - which this year includes 16 franchises - in 2013 but missed last season. Amateurs are paid to compete and can qualify for the Olympics via the event. "We have agreed in principle to enter a British franchise in the 2014-15 World Series Boxing," said the British Amateur Boxing Association (BABA). The Association added: "BABA has a responsibility to do as much as it possibly can to increase opportunities for boxers from Great Britain to qualify for the Olympic Games and given that so many qualification places are available through World Series Boxing, we believe it is in the best interests of our boxers to participate in the forthcoming season." The Lionhearts - beaten by Mexico in the quarter-finals in 2013 - have been drawn in a group with Ukraine, Russia, Algeria, Mexico, Morocco, China and Cuba, with the first fixture scheduled for January. The team will consist of members of the GB squad based in Sheffield and six overseas fighters added from a draft. On hearing the news of the Lionhearts' participation, England's Commonwealth middleweight champion Anthony Fowler tweeted: "Had some great news today, news that I think will very much help my journey to qualifying for the Rio 2016 Olympics." Fighters chosen for the London-based franchise will contest five, three-minute rounds in fixtures. The top-ranked fighters at the end of the competition will reach Rio 2016 and avoid the usual qualifying events.